Ok so before we get into this pesto potato gnocchi recipe, I just want to start this off by thanking serious eats. 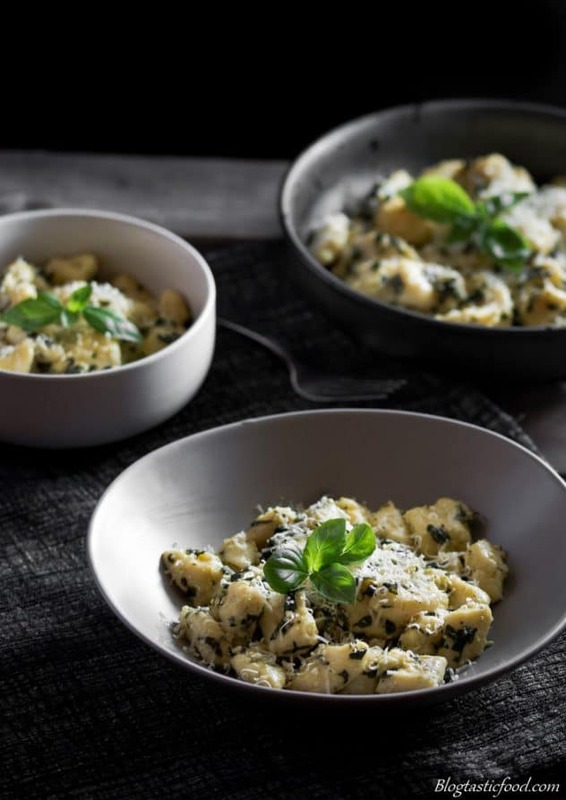 A huge food site that gives so much great advice and I read their article about how to make light and tender potato gnocchi. So feel free to click the link and check it out because you could get some great insight. As you can see I just tossed this gnocchi with a simple pesto and that’s it, nothing more. I didn’t add any meat because I honestly don’t think it is necessary. I haven’t had gnocchi that many times, but every time I do end up eating it, I notice how it looks deceiving because it seems like too little of a portion. Then before I know it I wind up being super full. Obviously, because the potato is very starchy and filling. So I don’t think any gnocchi dish needs to be bulked up. In fact, I think the complete opposite, making it as light as possible is what you should aim for. But of course, making sure it still tastes good. I didn’t blend the pesto and make it smooth either, I just bashed it up a bit in a pestle mortar to get the oils and the flavour extracting for the ingredients. And also because I wanted the pesto to have some texture. But feel free to prepare it how you wish. Thanks for checking out this post, hope you enjoy it if you choose to make it. Have a wonderful day and I will be posting again soon. Oh and stay tuned for Christmas recipes because they’re coming! 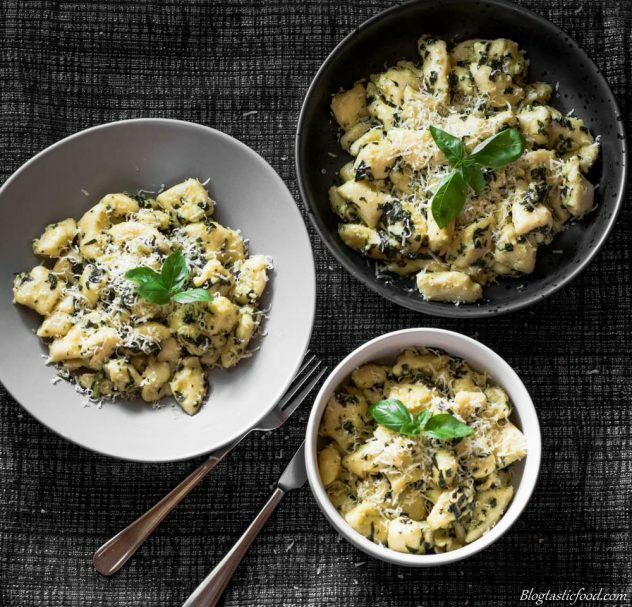 This pesto potato gnocchi is great for feeding and filling up the family. Hope you enjoy it! Drizzle 1 tablespoon of olive oil over your potatoes and coat them well. Put them on an oven proof wire rack, then put the rack onto a baking tray. Bake the potatoes in the oven for 55 minutes until cooked. Meanwhile, put your garlic clove in a pestle mortar with a pinch of salt, and bash until pureed. Then add your put your pine nuts, basil and 2 tablespoons of olive oil and continue to bash until the mixture is broken down and starts going paste like but still has some texture. Add your parmesan and stir through. Sift your flour in a large bowl, then add your egg, egg yolk and a generous pinch of salt and pepper. Take your potatoes out of the oven once they are done, and then cut them in half. Scoop the flesh out with a spoon and discard the skins. Put the potato flesh through a drum sieve or a potato ricer if you have either to finely mash the potato. Otherwise you can just push the potato flesh though regular sieve. Put the mash potato in the bowl with the flour and egg. Use your hands to bring all the ingredients together, then lightly dust your work surface with flour. Knead the gnocchi dough on the work surface for no longer than a minute, and if the dough gets a bit sticky, you can add a touch more flour. Stop kneading as soon as you have a smooth dough. Start bringing a large pot of salted water to a boil. (about 3 litres of water to half a tablespoon of salt works nicely). Cut the dough in half, then roll each half out into a sausage that is about half an inch thick (keep dusting with flour if need be). Use a small knife to cut your gnocchi as long as it is thick. Lightly dust a large tray with flour and transfer your gnocchi pillows on top. Add half of your gnocchi to the boiling water. While the gnocchi is cooking, get a cup and scoop out some of the starchy cooking water. Once the gnocchi floats to the top, wait about one more minute then use a slotted spoon or your sieve to transfer your gnocchi to a large bowl. Cook the other half of the gnocchi and again once it's cooked, put it in the same bowl. Put your lemon juice in with your pesto mixture and give it a good stir, then add to your gnocchi and start mixing together. You can also add some of the cooking water that you scooped out earlier to make sure that your gnocchi doesn't get klaggy and start sticking together. Season to taste with salt, pepper and possibly more lemon juice. Serve and enjoy you pesto potato gnocchi! Check out the link I provided in the post where Serious Eats gives more information about potato gnocchi. They really break down the process of making potato gnocchi. If you liked this pesto potato gnocchi then you will definitely love these prosciutto wrapped prawns with pesto dipping sauce. I love pesto and I love gnocchi. Two days ago my sister and I made a gnocchi maraton. I shall post a recipe once I have time, to compare with yours 🙂 These look delicious! 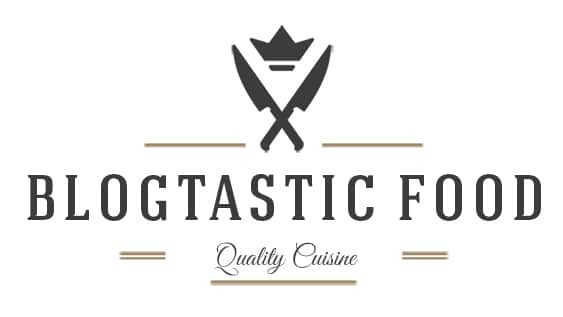 A great meal on its own or with a steak! Nick, this sounds great! 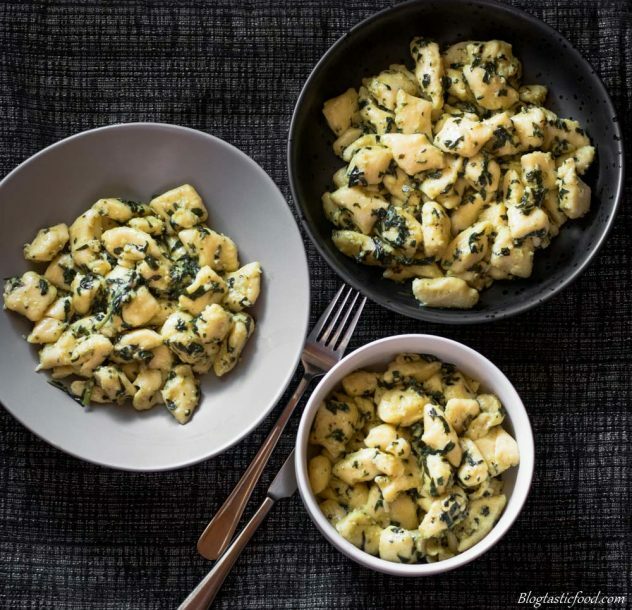 I have some pesto butter in the freezer from summer, and it would go great on these gnocchi! Nick– your photography makes every dish look mouth watering– this one included!! so pretty! Thank you so much for the lovely comments! Love serious eats. That gnocchi sounds amazing and you definitely give it a try! ? 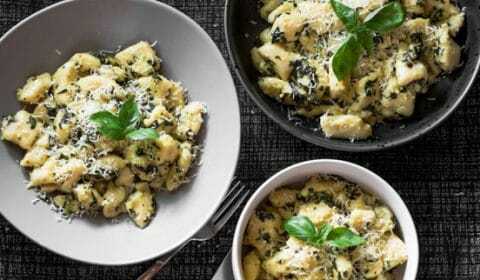 Looks amazing, pesto with potato gnocchi. I love my Mum’s with pasta sauce, but pesto sounds delicious. It’s been waaaay too long wince I’ve had a good bowl of gnocchi. This looks SO good- that pesto sauce is perfection. Gnocchi making was hitting my mind quite sometimes now!! !Gonna try this recipe soon! Your’s looking soo beautiful and delicious! Love your photography too ? what.an interesting site, so much to learn. good going.